Two years ago, Lianna Sugarman launched her line of organic, local blended juices, called LuliTonix (Luli is her nickname). For now, they’re only available in New York, but she’s working to expand that. In the meantime, here are Sugarman’s favorite ingredients so that you, too, can make impactful, healthy blended juices in your home. 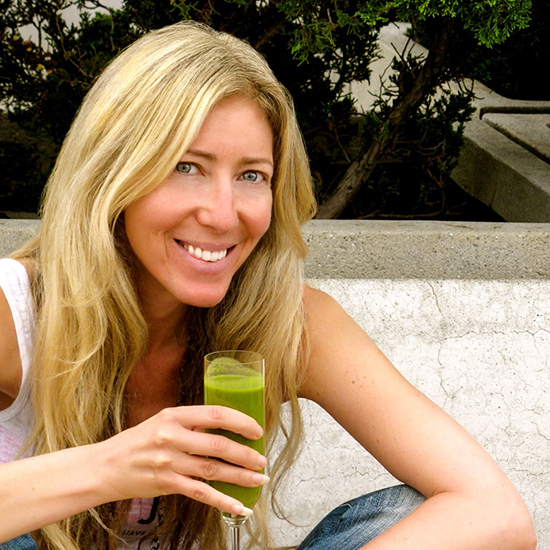 Two years ago, she launched her line of organic, local blended juices, called LuliTonix (Luli is her nickname). For now, they’re only available in New York, but she’s working to expand that. In the meantime, here are Sugarman’s favorite ingredients so that you, too, can make impactful, healthy blended juices in your home. I feel really, really strongly about greens. My first product line was green smoothies. But I think what most people think of as smoothies is just a bunch of almond milk thrown together with this and that. So I just coined the term “blend” instead. I definitely go for your standard greens: kale, spinach, lettuce, herbs. Greens are the basis for everything. I like to put in organic black Mission figs or Turkish figs, which add different layers of flavor, are alkalizing and are also just really yummy. I’ll leave some little bits in there. I’m launching some blends with microgreens, which are tiny, young plants that have an unsurpassed density of nutrients. I’m partnering up with this amazing company called Good Water Farms, and they grow the best microgreens anywhere. Avocado is a magic food. Its fats are so good for you, and it really helps the assimilation of nutrients. When you have a blend with avocado and greens and lemon, each of those components work to make all the different elements more accessible. They work so well together, breaking down the nutrients and making it easier for your body to digest. Avocados create an incredibly satiating drink. A lot of people are trying to limit their sugar intake and are avoiding fruit, and avocado is a handy way of creating this super-satiating, tasty blend that’s nutritionally complete, easy to take in, and they have no sugar. I started using mint in my blends before I really fully understood all of the health benefits. I put a lot of greens in these guys, and mint is a nice way to cut the chlorophyll taste that some people don’t care for that much. And mint is just really focusing. Herbs are filled with antioxidants. Basil is a blood purifier. Parsley helps nourish your kidneys. Ayurvedics is something I’m really interested in, and I’m studying up on it. I’ve learned through my acupuncturist and my exploration of Chinese medicine that I should always try to temper the cold and raw ingredients with some heat, which is why a lot of my blends use cinnamon, turmeric, black pepper. Even lemon juice helps to break down all of the raw produce. You want to stoke your digestive fire. I try to use elements like ginger, turmeric, lemon, cinnamon, cilantro, and things like that to kind of balance out the raw.